Selecting apples is the same, regardless of variety—choose apples that are free of bruises, are fragrant and are firm to the touch. When storing apples, keep in mind that apples ripen 6 to 10 times faster at room temperature than when refrigerated. Apples that will not be eaten in a day or two should be refrigerated in the crisper and stored by themselves (the fruit emits ethylene gas, which can cause other fruits and vegetables to decompose). To prepare apples for freezing, slice them and place the slices on a cookie sheet. Once individual slices are completely frozen, transfer them to a plastic storage bag. 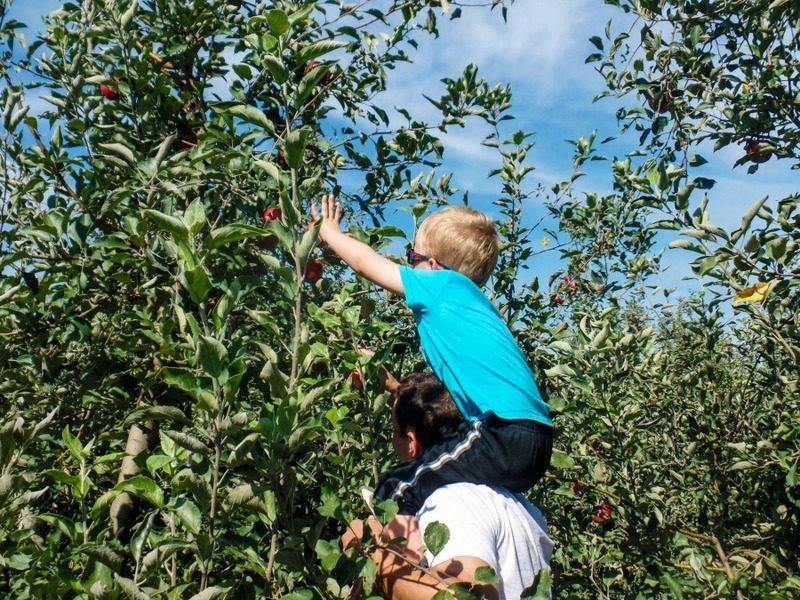 Join Us for AppleFest - Click to Learn More! Pinkish-orange stripes over a yellow background are the signature of this crisp, aromatically-sweet, snappy apple. Galas have gained popularity among consumers in the past 15 years. Excellent for eating, salads, pies and baking. Developed by the University of Minnesota, Honeycrisp has bright red and pale green outer skin and a cream colored crisp yet juicy inner flesh. With a sweet yet slightly tart flavor, this variety of apple is great for salads, baking, cooking or eating as a snack. The Honeycrisp apple was created to grow well in cooler northern climates. It is a variety that stores well. Eckert’s Honeycrisp apples typically ripen late August. Developed in 1953 in New York, Jonagold is a cross between the crisp Golden Delicious and the blush-crimson Jonathan. Jonagolds form a large sweet fruit with a thin skin. Because of their large size they are now favored by commercial growers in many parts of the world. Excellent for eating, salads, sauces and baking. Good for pies. Eckert’s Jonathan apples typically ripen in September. One of our most popular apple varieties, the Jonathan apple is a medium-sized sweet apple, with a strong touch of acid and a tough but smooth skin. Jonathans are excellent for eating, salads, pies and baking and are good for sauce. Eckert’s Jonathan apples typically ripen in September. Deliciously sweet, the Pixie Crunch is great for snacking. This mostly red apple is small (great for kids) and has a very nice crisp texture. It’s the all-purpose apple. Mellow and sweet, Goldens are excellent for eating out of hand, baking and salads. In salads and other dishes, their flesh stays white longer than other apples. They are also good for sauce and pies. Eckert’s Golden Delicious apples typically ripens in September. This one’s a classic – America’s favorite snacking apple. The heart-shaped fruit is bright red and sometimes striped. Crunchy with a mildly sweet flavor, Reds are excellent for eating and in salads; also good for baking. Eckert’s Red Delicious apples typically ripen in September. The creamy white flesh of this fruit is coarse grained and juicy, and quite firm and crisp. The flavor is even and sweet with just enough tartness. The old timers would call this “sub-acid;” it’s a nice balance. This is the best apple for long-term storage. Eckert’s Suncrisp apples typically ripen in October. Fuji apples have it all—super sweet, super juicy and super crisp. This Japanese apple has American parents, Red Delicious and Ralls Janet, an antique apple that goes back to Thomas Jefferson in 1793. Excellent for eating, salads, pies and baking. Eckert’s Fuji apples ripen in October. The Granny Smith apple originated in Australia in 1868. The fruit has a hard, light green skin and a crisp, juicy flesh. Excellent for salads, pies and baking. Eckert’s Granny Smith apples ripen in October. A hard, tart apple with a very rich flavor. Golden bronze in color with a long shelf life.